Who can resist a story about a baby koala? Orphan Smooch is rescued from dogs by Rose and her grandmother. But Rose is denied every girl’s dream of keeping a cuddly koala as a pet because he needs to be looked after by a trained carer. Despite her resentment, Rose forges a friendship with his carer and follows Smooch’s progress as he thrives and is eventually released. Rose is delighted when he makes his home on some trees in her family farm. But Rose’s world is far from rosy. She too is an orphan, still grieving her parents, and struggling to fit-in with the snooty girls at her school. Her grandmother cannot afford to keep the family farm going and it is soon sold to developers. Rose will have to move away from the only home she has ever known and live in the city. But even worse, Smooch lives in the very trees that are slated for clearing by the developers. And the developers do not seem to care about a small girl and her beloved koala. This book is about having the courage to stand up for what is right. 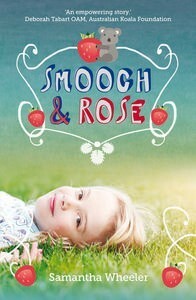 Although hardly able to deal with the bullies at school, Rose needs to find a voice to speak up for Smooch. This is Wheeler’s first book, and she has written a lovely tale for anybody who cares about the welfare of our native fauna – and whose heart melts at the thought of cuddling a koala.